Scotland are sitting last of the 28 teams after getting off to a disastrous start in the ISPS Handa World Cup of Golf in Australia. Russell Knox and Duncan Stewart mustered a solitary birdie in the first-day foursomes as they slumped to a six-over-par 78 in the $8 million event at Kingston Heath in Melbourne. The disappointing effort left them at the bottom of the pile, nine shots behind leaders Spain as Rafa Cabrera Bello and Jon Rahm set the pace. American duo Rickie Fowler and Jimmy Walker are a shot back along with French pair Victor Dubuisson and Romain Langasque and China’s Ashun Wu and Haotong Li. Trying to become Scotland’s second winners after Colin Montgomerie and Marc Warren pulled off the feat in 2007, Knox and Stewart started with a birdie-3 before adding three consecutive pars. They dropped their first shot of the day at the fifth before taking a 6 at the par-5 eight to be out in 35 in the company of Irish duo Shane Lowry and Graeme McDowell. The back nine, and in particular the final seven holes, was a stretch to forget for the Scots, starting with two more dropped shots at par-5s - the 12th and 14th. That spillage was followed by a double-bogey 5 at the 15th before a bogey at the last left them behind Malaysia and the Phillipines at the foot of the scoreboard. Lowry and McDowell opened with a level-par 72 to sit a shot behind English pair Andy Sullivan and Chris Wood. Kylie Walker had a disappointing second round in the inaugural Qatar Ladies Open on the Ladies European Tour. One off the lead after an opening 68 at Doha Golf Club, the Glaswegian carded a 75 this morning to slip back to one-under for the tournament. Ireland’s Leona Maguire, the top-ranked women’s amateur golfer in the world, has put her plans to turn professional on hold after withdrawing from the final stage of the LPGA Qualifying School. The Curtis Cup star is staying on at Duke University, where she is set to graduate in May, 2018. “This is not a decision that I have taken lightly but one that I feel is best for me in the pursuit of my long-term aspirations,” said Maguire. South Korea’s Jeunghun Wang has succeeded compatriot Ben An as the European Tour’s Rookie of the Year. Wang claimed the Sir Henry Cotton Rookie of the Year title after setting a host of records in May with back-to-back wins at the Trophée Hassan II and AfrAsia Bank Mauritius Open. They included the 21-year-old becoming the youngest winner on the European Tour since Matteo Manassero triumphed at the 2013 BMW PGA Championship, aged 20 years and 27 days. Wang finished the season in 16th position in the Race to Dubai rankings. Winning the Alfred Dunhill Links Championship has earned Tyrell Hatton the Hilton European Tour Golfer of the Month award for October. 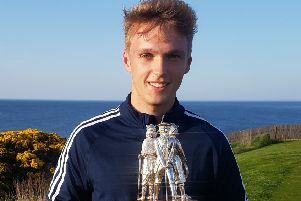 The St Andrews success was the Englishman’s breakthrough European Tour victory and included a course record-equalling 62 in the third round on the Old Course. “To get my first win at St Andrews was amazing. It was just such a special week from start to finish,” admitted the 25-year-old.